It was a good simple convenient motel room. I was able to leave my bag in the room early, the show had a good flow of hot water, and the traffic noise wasn't too loud. Great budget accommodation. Fantastic location. Easy to trams. Spacious for family. Good value. was a great place to stay plenty of parking, rooms had plenty of space. and the beds comfy, and even though the main road was just out the door it was not noisy could not even here the traffic, overall had a pleasant stay. Only negatives: Bed uncomfortable and the passage way was very noisy up until 3:30 AM. Excellent service from very friendly and proffesional staff. A lovely clean, quiet apartment. Value for money. Excellent free parking, and free WiFi. Friendly owners. Very happy! Certainly good enough to do again. Loved the daily service with nice clean towels,etc. Nice hot water and quiet fridge.Very quiet location. Great space for belongings. Felt safe and secure with the entrance gate closed at night. Have arthritis in legs and knees so found the stairs difficult but luckily not too many stairs. I arrive late at the hotel about mid-night there were no staff at the reception, but the hotel has arranged for me to pick up my room key from a safe box. So everything works out well, I got in and found my room easily, in my room I found a iron and board which I needed to prepare for my business meeting the very next morning. Very Good Experience, would stay there again. Really easy transport at the front door to the city great price for the apartment we stayed in would definately stay again next time in Melbourne thank you we enjoyed our stay. Having driven to Melbourne, it was a good place to leave the car and take the tram into the city. The room was clean and quiet. Convenient, comfortable. Kitchen sitting area very small for 5. 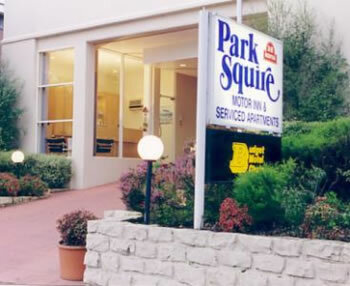 I have stayed with Park Squire before and it has always been a pleasant experience. I just felt sorry for the poor staff member being abused by another customer as we left. No-one should be spoken to like that. I was very happy with our stay at Park Squire. When we experienced a problem with the hot water system the staff acted immediately to resolve the difficulty. The cleaning staff were very efficient and the reception staff helpful. I will recommend Park Squire to other people as a good place to stay in Melbourne. I appreciated the internet as part of the accommodation cost and the facility to change money and buy washing powder at reception! We stay at the Park Squire 2-3 times a year. Excellent value for a motel that is conveniently located about 10minutes to CBD by tram or train.Rooms are clean and tidy and staff are very helpful. We always feel comfortable staying at the Park Squire. We had an enjoyable stay, using the trams to get into town with our miki cards. And a direct route from the airport. The villa was great with the 3 bedrooms and the lounge kitchen area open plan made it easy to be involved with what was going on. Good service and advise with off street parking. We had a wonderful experience during our stay at Park Squire Motor Inn and will definately be returning. As older guests we found stairway access very difficult, particularly when takiing luggage to and from the apartment. quiet and peaceful and stay. Good service, good location, clean and tidy. Great wi-fi internet access. Stairs and external walls of rooms a little dated. Will stay there again! I was very happy with my 3 night stay. The only problem is that wireless inernet was not funcitonal for majority of my stay. This was considerable inconveience as I was requried to do significant work whilst staying. The main reason I chose to stay here as opposed to other place was because of internet, yet this was not available for majority of my stay, causing me much trouble with my boss from work as i was not able to do my work. Apart from that, everything else was fine. Only staying there for one night, we found the apartment room comfortable and spacious and private. Room was fine for me....price and location perfect...Trams outside the door of the motel that take you stright to the city...Staff were helpful. Internet available. Plenty of coffee, tea bags and sugur...Milk. Had everything I needed..Room was clean....It was a nice stay..
Park Squire was great for me and my sister, it was close to trams in and out of the city, the rooms were comfy and very clean, would definitely stay there again.